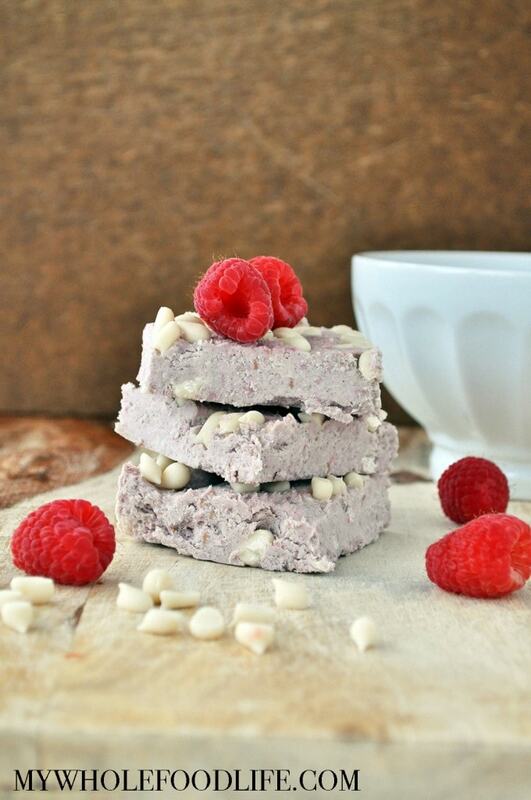 White Chocolate Raspberry Squares. If you make anything, you must make these ASAP! We made a stop into our local vegan bakery, Reverie Bakeshop last weekend. They are awesome by the way! I noticed they started selling homemade, vegan white chocolate chips. The ingredients were mostly clean too. Just cocoa butter, evaporated cane juice, vanilla extract, oil and salt. I bought a bag and promptly got to work making these White Chocolate Raspberry Squares. If you love raspberry, you may also like my Chocolate Raspberry Vegan Cheesecake or my No Bake Raspberry Macaroons. This recipe only contains 5 simple ingredients. It is gluten free and vegan. If you replace the chocolate chips, or omit them, this can also be paleo friendly. If you are not vegan, feel free to use regular chocolate chips if you like. When Marcus came home from work and tried one of these, the first thing he said was, “Oh my god! These are heavenly!” I guess that means they are tasty haha! I hope you enjoy them too. Looking for more raspberry recipes? White chocolate, raspberry, coconut heaven! In a food processor , combine the coconut butter, raspberries, maple syrup and vanilla. Mix until smooth. Then add the 1/4 cup white chocolate chips and pulse a few times. Press the mixture into an parchment lined 8x8 glass baking dish. The mixture will be very sticky and you may need to wet a spatula to press it in. Sprinkle the top with more white chocolate chips and gently press them in with your palm. Place in the fridge to firm up. Should take 30 minutes to an hour. Once firm, cut into squares with a pizza cutter , and store in the fridge or freezer. They should last 2 weeks in the fridge and up to 6 months in the freezer. Enjoy! Which white chocolate chips do you use? I love how you say "my local vegan bakery" like it's totally normal!!!! I want to move to your neighbourhood! Added bonus- I could pop round and steal a couple of these! I am so lucky it's only 5 minutes from my house! Love it.